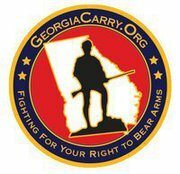 GeorgiaCarry.org, the premier voice for the Second Amendment in Georgia, will be holding its third annual convention this weekend, at the Renaissance Waverly Hotel near the Galleria in Smyrna, and I will be there. If you’re going to be at the convention, email me or send me a Twitter message and we’ll get together. The deadline for buying tickets was last weekend, so if you don’t already have your tickets, you’ll have to wait until next year. But, GeorgiaCarry members can still attend the “Meet the Board” session from 11:00 AM to 12:00 noon. Just show your membership card. Convention attendees can also enjoy a light breakfast, coffee, and a morning at the Sandy Springs Gun Club and Range , from 9:00 AM to noon, for just $5. Just bring your convention badge. A map to the range can be found here.